Blog Why I Love The Ethos Stack of "X - the Ultimate Theme"
Judging by feedback, people love the look of this blog. Much credit goes to my daughter, who made the gorgeous header and helped get the colours just so, and to Themeco, who developed the theme X. It’s also partly down to the tech support staff at Themeco, who answered question after question, and to the tech support at Go Daddy who helped me understand those answers! My daughter and I looked at dozens of themes, and tested out one or two. X was among those we looked at, and we both liked it, particularly the Integrity stack. PLEASE NOTE: This post refers to an older version of X. Some features have changed and as yet Cornerstone is not included in this review. What the heck is a stack? If the term stack baffles you, think of it as a framework. If the theme is the outer shell of a house, then the stack is how you then divide up the rooms inside that shell. When we started looking at X, it had 3 stacks – Integrity, Renew and Icon. Integrity looks most like a traditional blog, while Renew and Icon would possibly be more suited to company websites. Eventually, we narrowed it to X or Prophoto. Several bloggers I know use and recommend Prophoto, so I was tempted to go for it. 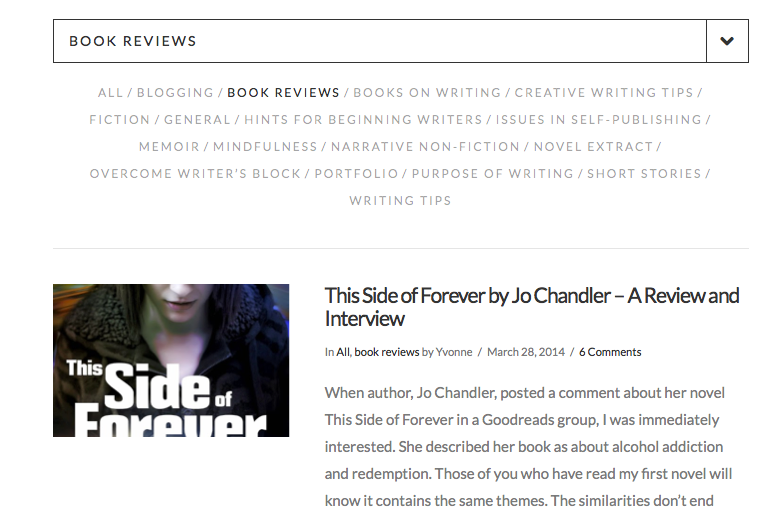 I liked the way its front page could display blog excerpts with thumbnail photos. But, at $200, Prophoto is pricey, even if you can use it on two blogs. Most themes cost around $40, and X is just a little more at $64. So we took another look at X. It had a new addition: the Ethos Stack. We both loved it, even though is aimed at magazine sites or newspapers. It’s Ethos you see on this blog. As well as those post extracts with thumbnail photos that I so wanted, Ethos has options to add a post slider below the menu-bar (which I did) and a post carousel above the header (which I didn’t.) With the post slider you can either showcase posts at random or choose which ones you’d like to highlight. Because some photos look better in it than others, I recommend selecting your posts. (This is very easy to do.) We also loved the sleek look of the overall design. PLEASE NOTE: I have removed the post slider from my front page because it now stretches across the top of the sidebar. I didn’t want that on my front page, but you can see the slider on category archive pages such as this one for Creative Writing Tips. I still consider the Ethos stack to be a great theme and will update this post very soon. When you click on any topic, the listing changes, right there on the main page. The filter automatically displays your categories as topics, making it very easy for readers to skim through content. This feature isn’t perfect, as I’ll explain later, but there is a very easy workaround, which I will also explain. Many of the changes to a theme that are usually made using CSS, can be done in the Customizer. If you aren’t familiar your blog’s customizer – it allows you to make changes to your theme and instantly see them in the live previewer. Although this is a WordPress feature, Themeco have placed more functions in the Customizer than many other themes do. Since my daughter knows CSS and I don’t, we had intended that she would do most of the customization. However, I was able to do far more of the work myself than I’d expected to. 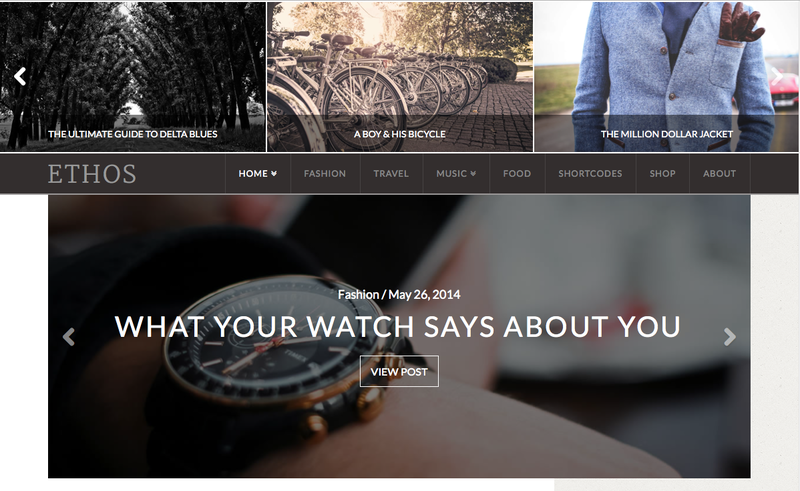 Given that Ethos is not aimed at blogs, there were surprisingly few issues with applying it to a blog. For us, the only major challenge was the header. I wanted a full width header, but the default setting does not support this. The screen shot below is from the demo site for Ethos. Looking at the screenshot above again, notice that at the very top is the post carousel, followed by a bar that contains the word “Ethos,” and the menus. In X terminology that word “Ethos” is the Logo, and this arrangement is Logo and Navbar arranged inline. 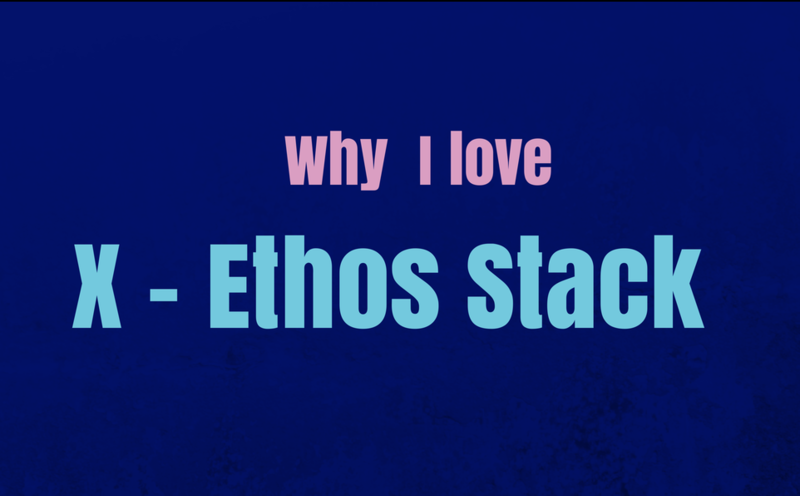 Arranging them stacked would move “Ethos” up. My name, which had where “Ethos” was in the demo example, has now disappeared, and there are black bands at each side. Getting the name back was easy enough – my daughter just added it to the header in Photoshop. Creating the full width header was more complicated, and involved making changes in the control panel files, as well as adding CSS in the Customizer. It was also the main reason for the many messages back and forth on the forums. The other obstacle to overcome was considerably less complex. Remember I said that the Topic Filter isn’t perfect? Here’s why – at its default setting, instead of all recent posts showing on the home page, with the filter activated, only posts in the first category show up. Since this is only my second post in the “Blogging” category, that would mean a very empty home page. It would also mean that if my most recent post was in any other category it wouldn’t show on the first page. When I realised this I headed over to the X forum, and discovered that many other people also wanted the default setting to show all posts. Themeco’s tech support responded by providing the code needed to do this. However, it involves editing files in your blog’s cPanel. 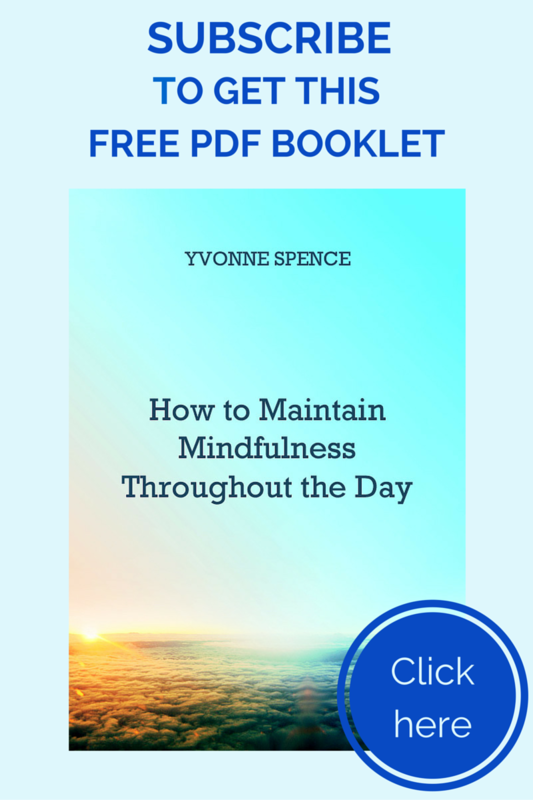 Although I feel really pleased to have eventually understood how to edit files well enough to get the header to work, it was with a huge amount of support from both Themeco and Go Daddy, and I really didn’t relish another steep learning curve quite so soon. Besides, since so many people are asking for the default setting to show all posts, I have a feeling Themeco will soon respond by providing this. Notice that the first category is “All.” This means that all my recent posts now show up on the first page. I added this as a category and added the first page of posts to that category. (Since it’s so easy to navigate through the filter, I think it’s unlikely that anyone would scroll further than the first page of posts so I haven’t categories older posts as “all.”) It does mean the most recent posts are categorised twice, but for now I’d rather have that than tackle my cPanel files just yet. If Themeco don’t make any changes to enable “All” as default, then I’ll probably muster up the courage in due course! In spite of these two minor hiccups, now that Ethos is up and running, I really love it! If you came to this post direct and haven’t been to the home page, do go there now and test out the cool features, especially the Topic Filter. And then come back and drop me a comment letting me know what you think! I love getting comments. Hi, really enjoyed your article. super helpful. currently considering buying X theme. Just one question, did you need to buy anything apart from the $60 x theme? guess what im asking is, is it a standalone product, or does it need child/parent themes with it. Just want to understand how much I’d be looking at considering I really like the look of Ethos. I’m glad the article was helpful for you Rota. You don’t need to buy anything other than the X Theme. I do have this on a child theme because I made a few adaptions, but it comes with the package. It’s a very versatile theme. I love it. I just checked the price and it has gone up a little, but only to $63. Let me know if you get it, I’d love to see what you do with it! Hi, great post! I would really like to know how you created the beautiful full width header on this blog. I also got the X Theme and using Ethos. Would really appreciate if you could share with us how you did it. Love your article; definitely played a huge part in my decision to purchase XTheme. A newbie does not do me justice in this field of work. I feel like a fish out of water. I could not get off the ground; purchased yesterday and I can’t understand how to upload the theme. I hope it’s not going to be difficult working with this them. Can you help me get this figured out. I am so glad I kept this article on my cell. Thank you so much. P.S. I am new to blogging but you have given me the courage to get into the cyber world. Bernadine, I’m glad you found the article useful, and glad you’ve found courage to get into the cyber world. Now I think about it, I did have a problem uploading X, but that was because I’d set my blog up wrong and had ended up with a multi-site. This meant there were limits on the size (in megabytes) of any uploads. So the first thing I’d say is check to be sure you’ve got a single site set up rather than a multi-site. You’ll be able to tell by checking the top left corner of your dashboard. If you have installed WordPress properly, you will have your blog’s name and below that “Dashboard.” If you did what I did, you’ll have “Netword Admin” somewhere in that top left corner. Also check out the website http://www.fabulousblogging.com for general blogging advice. She’s got tons of great tutorials. Hope this is of some use to you. Good luck with getting started, and do get back in touch. I’m testing X theme to make sure I will have no problems later on. I would like to know how you got the Main right sidebar (widget) all the way up? I notice the slider is smaller than the demo site, that’s what I need to do. Do you have the shortcode for testing that step? Hi Jean-Luc, sorry for taking a few days to reply and sorry too that I can’t actually remember how I did that! I will see if I can figure it out and let you know. Not sure if this is any help, but I have the site max width set to 1200, the site width (%) set to 88, the content Layout to “Content left, sidebar right” and the content width (%) to 72. I will be a blogger someday. Right now, I am doing my best to become a web designer. I bought X for the Ethos ‘stack’ about six weeks ago. I was naive. I assumed the ‘stack’ was the full suite of templates in their demo site. I was disappointed to learn that it’s just the front page of the demo you choose. I’d jump on one of packaged themes (church, spa, agency) they are selling now if they had one suited to simply blogging. I’ve made dreadfully slow progress. Sadly, my website is still far from being ready for prime time. I’m still formatting and tweaking the little things I’ve successfully put in place, or spending entire days going in circles while getting almost nothing tangible accomplished. X is a plug and play theme to a large extent. It’s one of the things that attracted me to it. If I’d been on WP or any other blog platform before, part of my learning curve would be flatter. I have zero web development background. All of this is foreign territory with far too many necessary steps and entities (WP, host, Cornerstone, customizer, image optimization, registrations, passwords, plugins) for me to assimilate into my foggy brain. I continue to fumble my way through. The forum has provided some detailed hand-holding instructions but other times it gives fragments of (useless-to-me) instructions as they are able with people who know what they are doing. My host is helpful but the long waits on the phone or for a chat response are annoying. I found your nice essay during round #472 of my frantic search for answers. I’m thankful for the few gems I’ve found in YouTube dealing specifically with X. I’ve assembled tons of great resources for blogging that I’ve tagged for later research. I go to sleep and wake up with videos about web design. My head is spinning from cramming to get a grasp of CSS and to touch on the bare essentials of HTML. I signed up for Lynda lessons and found them OK on the basics but not helpful on the specifics of what I need. Everything past the basics was far too advanced for me. I’m envious of your help from your daughter. I need to rent-a-nerd. I want to learn this, not contract it out. I want to be able to maintain and improve my website on my own. I’m making myself find patience and not give up hope. I like the look of my landing page. I chose Ethos 2 with the big parallax photos. Once I saw that demo, I was smitten. I will pull it together, someday. I’m just shocked to find out what I don’t know and how complicated it is to build a website. My stuck point is that I cannot make myself use the default blog page from WP. It’s too plain Jane. I haven’t been able to figure out how to get rid of all the WP tag-along crap that opens with it. I want a photo-rich posting area to match my nice front page. I want an X Theme blog page and I can’t figure out how to construct it. Now that I’ve been exposed to all the cool features and effects that can be done with X, I’ve gotta have them on mine. Maybe I’ll figure it out next week. . . Sorry to see you are finding it complicated. But good you are getting support from the Facebook group. I haven’t actually updated to Cornerstone, and I can relate to your head spinning when trying to understand HTML or CSS. I wish you luck with getting your site finished. The one thing you can know is that it will be gorgeous when it’s done!